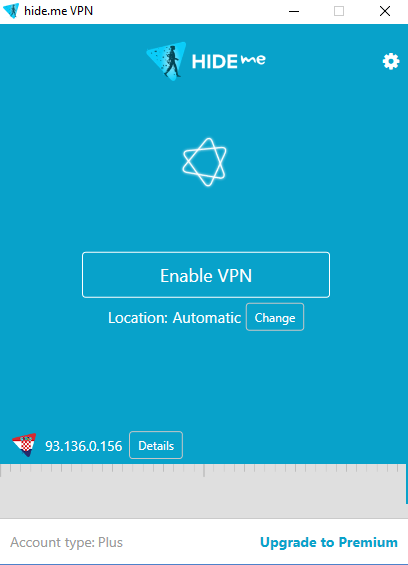 What is your opinion on hide.me VPN? Hide.me is easy to install and can be used on a number of platforms, including Windows, Mac, iOS, Android, MS Surface, and Windows phone. It can also be configured to work with most routers, Linux, Blackberry, Kodi, and more. All you need to do to get started is create an account on hide.me, download the file, install it on your device, login with your username and password, and connect. If you have any questions about setting up hide.me you can use the step-by-step guides on the website to guide you. Hide.me also has an active online community that can help you with any problems you might face. The app will let you connect to the protocol of your choice including PPTP, L2TP, IPSec, SoftEther, SSTP, and OpenVPN. If you’re planning to manually configure the VPN, there’s a separate configuration process for each protocol. There are two paid packages to choose from. The Premium package is the costliest, but it lets you connect up 5 devices simultaneously and includes port forwarding. The Plus package includes unlimited bandwidth and 75GB of data transfers per month. Both plans come with a 14-day money-back guarantee. There are several payment methods including credit cards, PayPal, and Bitcoin. Hide.me also offers a very basic free service with access to just three locations and 2GB of data. There is no OpenVPN support for free users. Hide.me offers live chat, email (support@hide.me), Facebook messaging and a contact form. The live chat was instant, and we never had to wait more than a minute. Even the ticket system, which can take up to two days, was sufficiently answered within five minutes. There is also an active online community to help you sort out any problems and connect with others. Hide.me is a VPN provider that keeps no logs and aims to put safety and security at the top of its priorities. They offer servers in 55 locations across 34 countries. The speeds are also generally good, faster than many other services we've seen, despite the high level (AES-256 bit) encryption that they offer. You can choose from a wide array of protocols to best suit your needs. They also offer a limited free access to 3 servers, allowing you to test out the system without any time limits. Hide.me is known for speed, security, and transparency. They do not keep logs, which makes their VPN very reliable. Also, with apps for almost all major platforms, they are a favorite among millions of users. Hide.me has 160+ servers across 55 locations in 34 countries, across Asia, Europe, and North and South America. The service uses a wide range of protocols: IKEv2, PPTP, L2TP, IPsec, OpenVPN, Softether, SOCKS, and SSTP. They offer AES-256 encryption and a kill switch for maximum security. The service is compatible with multiple devices including: Android, iOS, macOS, Routers, Windows, Windows Phone, Chrome, Firefox, and BlackBerry, and allows up to 5 simultaneous connections. Hide.me has three plans to choose from; Free, Plus, and Premium. While free users cannot access OpenVPN, there is always the option to upgrade to a paid plan for the best security. Hide.me also offers a free anonymous proxy browser to easily access blocked websites, but if you’re already using that, it’s worthwhile to download their free VPN. The best thing about hide.me is that their free VPN is totally free and there are no ads. You also get complete customer support with the free package. However, you are limited to 2GB per month and no access to OpenVPN. If you decide to move to a Plus or Premium plan, you can do it risk-free – there’s a 14-day money back guarantee on all paid plans. Hide.me users can get a complete refund within 14 days of buying a subscription if they haven’t used more than 500MB of data. With both Plus and Premium, you can connect to the 30+ hide.me servers in 28 countries. While the Plus plan gives you a max of 75GB data transfer per month, Premium lets you access unlimited data. Also, with the Plus plan, you can connect only one device per connection. Premium lets you connect 5 devices on a single connection. If you’re a premium user, you can use a fixed IP address and UPnP (Dynamic port forwarding). . While hide.me can’t access the US Netflix content, it does allow torrents and P2P sharing on most of its servers outside the US, UK, and Australia. With active customer care, zero logs policy, free service, money back guarantee, multiple apps, cross-platform compatibility, P2P support, and a lot more, hide.me could easily become your favorite VPN provider. If you're looking for other free VPNs, there are plenty of them.